Dear Lord Jesus, help me to see how much I influence other lives through my own life. These human beings, the gift of children You have given me, are totally dependent on me from even before they came into this world, and because of a mother's love, even continue to be dependent in some ways as adults. Please grant me the graces I most need as a mother of my children. Help me to be the prayerful and loving example I should be. 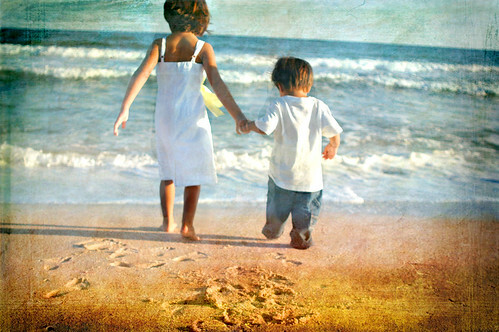 I pray for insight, wisdom, strength and patience to love and nurture my little ones with holiness. Thank You for the incredible gift of life! "Todays' solemnity directs our gaze to Rome, the center of Catholicism. As Catholics, our identity, meaning, and direction only have fulfillment in so far as we are united to the Vicar of Christ, the visible head of the Church. The challenging times that we live in provides countless opportunities to be heroically faithful to the Magisterium of the Church. In order to continue his work on earth and lead all peoples to eternal salvation, Jesus established one visible and hierarchical Church. It is very clear from the continual preparation of the Jewish people in the Old Testament and then with the precise act of Jesus in Cesarea Philippi, that God willed to found one Church as a visible, hierarchical, living, and continuing authority, to teach, govern, and sanctify in his name. It is no less clear that Jesus appointed the Apostle Simon the fisherman as the visible head of his Church. 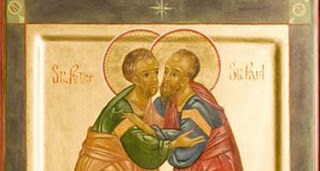 Even as he conferred the authority, Jesus changed Simon’s name to Peter; i.e. rock. The name Peter had never existed prior to this divine event in Cesarea Philippi. 'Blessed are you, Simon son of Jonah! For flesh and blood has not revealed this to you, but my heavenly Father. And I tell you, you are Peter, and on this rock I will build my church, and the gates of hell shall not prevail against it. I will give you the keys of the kingdom of heaven, and whatever you bind on earth shall be bound in heaven, and whatever you loose on earth shall be loosed in heaven.' (Matthew 16: 17-19). So many of us are concerned about our health - what we eat, how we exercise. I thought I'd pass on some valuable information to all of you today. Perhaps this doctor's expert opinion will help ease your minds about your own routines and regimes. extend the life of your car by driving it faster. Want to live longer? you 100% of your recommended daily allowance of vegetable products. even more of the goodness that way. Beer is also made out of grain. A: Well, if you have a body and you have fat, your ratio is one to one. If you have two bodies, your ratio is two to one, etc. permeated in it. How could getting more vegetables be bad for you? should only be doing sit-ups if you want a bigger stomach. Q: Is getting in-shape important20for my lifestyle? fats and suffer fewer heart attacks than Americans. Thanks for allowing me to "pull the wool over your eyes" for about half a minute there! We have to lighten up and have some fun once in awhile, right? Purity in the Catholic Classroom? Go on over to my Embracing Motherhood blog to read the post about purity in the Catholic classroom. Please chime in and support this new blog created by a concerned Catholic mother. Just the thought of summer fast-approaching could bring thoughts of rest and relaxation to mind. We may recall the lazy days of summer during our youth. Summer may also mean anticipated excitement and adventure: exploring new places or trying new things. Some families plan escapes to beaches and paradise vacations, while others may stay home and plan day trips to fun spots, the local library, or parks and recreation centers. Summertime can be a time of well-deserved rest and also a welcome change of scenery. 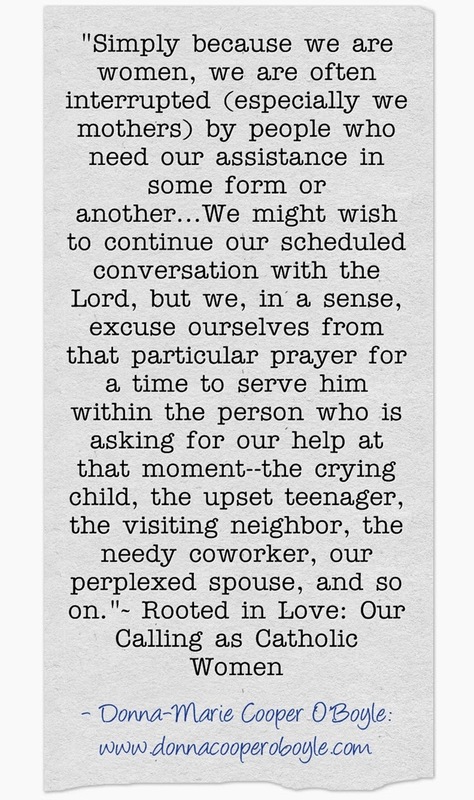 While making plans for our families this summer, let’s not forget about prayer. A change in schedule once we hit summertime and an eagerness to “get away from it all” could cause us to lose touch with our spiritual needs. One strategy to help us remain prayerful this summer is to begin each day with prayer. This simple suggestion may seem like a no-brainer to a praying individual; however the busyness of mornings and preparations for summer outings of even the well intentioned “pray-ers” can cause prayer time to become lost in the commotion. When making plans for family trips, perhaps we can think about including shrines, basilicas, and holy places in our trips. When researching places of interest for our family this summer, we can utilize the many Catholic magazines, newspapers, and websites that often highlight interesting places for pilgrimages and visits. We can attempt to attain that nice balance of nourishment for our family’s spiritual life and fun and enjoyment to relax and entertain our senses. Summer travel affords us many opportunities for prayer. Prayers such as the rosary can be said in common in the family vehicle en route to a vacation spot or while traveling to the beach, park, or picnic area for day trips. Each child can voice a prayer of petition about something that is close to their hearts and offer prayers of thanksgiving for God’s gifts — including family time together. Naturally, we will want to ask our good Lord for His protection over our family as we travel. Annoyances and inconveniences can crop up at any time. Summer doesn’t automatically translate into bliss. However, the traffic jams, whiny children, bug bites, sunburn, or unexpected delays and mishaps can be turned around and used for good. We have a perfect opportunity to “offer it up” to God and ask Him to use a small sacrifice or inconvenience on our part for the good of others, rather than allowing the situation to cause us to become annoyed or angry. Let’s keep our cool and turn to prayer. We can ask our Lord to use our sufferings for the souls in purgatory so that they can get to Heaven a little faster. These prayer times are not only spiritually enriching and gifts for the recipient, they also become beautiful teachable moments, pointing our children to patience and thinking of others during trials, helping them turn to prayer rather than allow a negative situation to get the best of them. Whatever your family plans may be this summer, be sure to have fun, enjoy, and offer your joyful heart to the Lord! Your example of prayer throughout the summer days will inspire your family and others that God puts in your midst. Have a happy and holy summer! So, what are your summer plans? Please share with us! 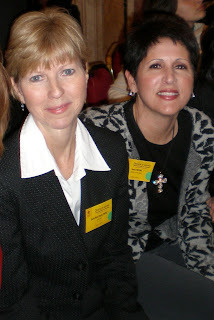 Some time ago, I discussed sith my friend Teresa Tomeo, some of the pressures that are heaped upon Moms these days and also some prayer strategies on our Mom's Corner segment on "Catholic Connection" (Ave Maria Radio and aired through EWTN). In case you didn't catch the segment, You can listen right here today or any time that you have a few minutes. What are your strategies? How do you fit prayer into your lives? What do you do to combat the pressures of the culture aimed at women? Please share your ideas and strategies for prayer with all of us. I will look forward to hearing from you! May God bless your day! Happy and blessed day to all of the fathers out there and all who are in a father role. Let's not forget about our priests! Dear St. Joseph, please look down upon fathers and priests everywhere today and always! Amen. Happy Feast of the Immaculate Heart of Mary! 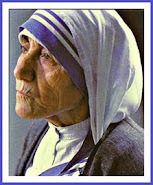 As Blessed Mother Teresa of Calcutta taught me, "Mary, Mother of Jesus, be a Mother to me now." May you all have a BLESSED day, basking in our Mother's goodness and blessings! Happy Feast of the Most Sacred Heart of Jesus! Happy feast day! It's a tremendous and glorious occasion! I hope you can get to holy Mass! "Monsignor John Esseff is on a mission from God. He hopes to have the Sacred Heart of Jesus enthroned as King of the entire world, family by family, church by church, dioceses by diocese…country by country. Accompanied by other priests, he is now embarking on a tour to meet with cardinals worldwide to solicit their support to develop an official plan within the Catholic Church to enthrone Jesus as the King of our world and present this plan to the Pope. This may sound idealistic, but with so many friends in high places, my money is on Monsignor. Oh, and by the way, this ambitious plan includes everyone, even Osama bin Laden. Washington D.C., Jun 9, 2009 / 01:18 am (CNA).- The U.S. bishops’ conference has set up a website to help mark the Year for Priests by providing prayers and other resources. Pope Benedict XVI designated the Year to begin on the Feast of the Sacred Heart of Jesus, June 19. His announcement also designated St. John Vianney, the patron saint of parish priests, as the Universal Patron of All Priests. 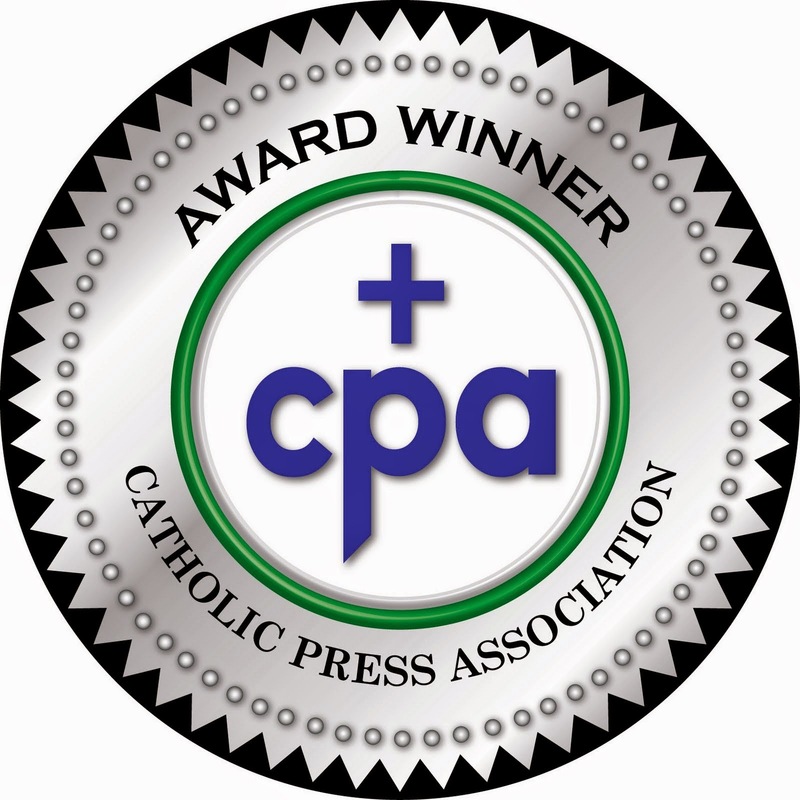 According to a press release from the U.S. Conference of Catholic Bishops, the Secretariat for Clergy, Consecrated Life and Vocations has set up a website in service of the year’s theme. “Please pray for our priests that they might always be faithful to their sacred calling,” the site says. The site includes Pope Benedict’s message for the Year of Priests and the announcement of the celebration’s plenary indulgence in English and Spanish. 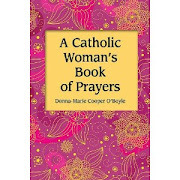 It also provides prayers for both priests and laity in PDF format so that they may be downloaded and printed for diocesan and parochial use. The Secretariat plans to provide monthly articles by prominent Catholic women who will write about their “faith and trust” in the priesthood. VATICAN CITY, - The Vatican is offering a plenary indulgence for all faithful on the occasion of the Year for Priests, which is set to begin June 19 and last one year. The decree was made public and signed by Cardinal James Francis Stafford and Bishop Gianfranco Girotti, respectively penitentiary major and regent of the Apostolic Penitentiary. The Year for Priests marks the 150th anniversary of the death of St. Jean Marie Vianney, also known as the Curé de Ars. The decree noted that Benedict XVI will preside at the opening liturgy June 19, the solemnity of the Sacred Heart of Jesus, "a day of priestly sanctification." He will celebrate vespers before the relics of the saint, brought to Rome for the occasion by the bishop of the French Diocese of Belley-Ars. The Year will end in St. Peter's Square, in the presence of priests from all over the world "who will renew their faithfulness to Christ and their bonds of fraternity." For priests, the plenary indulgence can be gained by praying lauds or vespers before the Blessed Sacrament exposed to public adoration or in the tabernacle. They must also "offer themselves with a ready and generous heart for the celebration of the sacraments, especially the sacrament of penance." The plenary indulgence, which under current norms must be accompanied by sacramental confession, the Eucharist and praying for the intentions of the Pope, can also by applied to deceased priests. Priests are granted a partial indulgence, also applicable to deceased priests, every time they "devotedly recite the prayers duly approved to lead a saintly life and to carry out the duties entrusted to them." 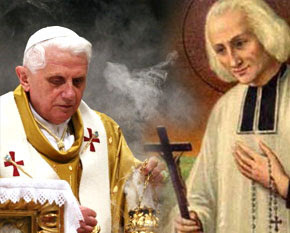 For the faithful, a plenary indulgence can be obtained on the opening and closing days of the Year for Priests, on the 150th anniversary of the death of St. Jean-Marie Vianney, on the first Thursday of the month, or on any other day established by the ordinaries of particular places for the good of the faithful. To obtain the indulgence the faithful must attend Mass in an oratory or Church and offer prayers to "Jesus Christ, supreme and eternal Priest, for the priests of the Church, or perform any good work to sanctify and mould them to his heart." The conditions for the faithful for earning a plenary indulgence are to have gone to confession and prayed for the intentions of the Pope. The elderly, the sick, and all those who for any legitimate reason are unable to leave their homes may obtain the plenary indulgence if, with the intention of observing the usual three conditions as soon as they can, "on the days concerned, they pray for the sanctification of priests and offer their sickness and suffering to God through Mary, Queen of the Apostles." A partial indulgence is offered to the faithful when they repeat five times the Our Father, Hail Mary and Glory Be, or any other duly approved prayer "in honor of the Sacred Heart of Jesus, to ask that priests maintain purity and sanctity of life." Tomorrow on the Most Sacred Heart of Jesus feast we begin the Year of the Priest. Go on over to my blog: Daily Donna-Marie to read more. Jennifer is delighted at what she came across in her Bible last night. She said, "I read something cool in my Bible last night: 'But she will be saved through motherhood, provided women persevere in faith and love and holiness, with self control' (1 Tim 2:15). (If that's not inspiring!!!) ♥"
Yes, Jennifer, it is totally inspiring and I think we have to shout it from the rooftops! My version of the Bible (one of them) which is the NRSV Catholic Edition reads, "Yet she will be saved through childbearing, provided they continue in faith and love and holiness, with modesty." While that verse in First Timothy is quite a mouthful, especially if you take it word for word and really ponder it; these words should soothe our mother's hearts. Whether we bear children biologically or lovingly accept them through adoption, our vocation of motherhood is the means to our sanctification and the sanctification of our families. I spoke about this very thing at the retreat I gave in Corpus Christi this past week end. What ways do you feel that God is working within your mothering? The people in Corpus Christi are among the most hospitable people I have ever met. They welcomed my daughter, Mary-Catherine and me with open arms. We had a lovely and grace-filled time there. I was very cognizant of the fact that Our dear Lord had me there in Corpus Christi on the feast of Corpus Christi, which I thought was pretty cool. It was also wonderful to meet some of the women that I had been corresponding with for some time and to see my friend, Fr. James again. We were able to participate in two of his Masses, including a high Mass on the feast day. God is so good! I gave two talks - one on a mother's call to holiness and the other on carving out time for prayer amid the busyness of a Mom's life. We had a Q & A, an activity, and meals together. My daughter and I fit right in with this lovely bunch of Catholics - "serious Catholics" as Fr. James calls them. It was very tough to leave when the time came. But, I'll be back, I'm sure. :) We are already discussing future plans. By God's grace, amazing things always happen at these events. Catholic womanly camaraderie is powerful! God is so good to us and His love is MIRACULOUS! Here's a photo of me with some of the women who call themselves the "Graceful Gals" who did a study of my book, The Domestic Church: Room by Room. I found out that three studies were done by three separate groups in Corpus Christi. I'll have to see if I can get other photos of the other groups. Right after the retreat day, my daughter and I were escorted off to the beach for a quick walk on the sand and to feel the breeze and smell the salt air. Here I am with Ada on the left and Nury on the right. We all became fast friends from the moment we met at the airport. We were blessed the following day after a extraordinarily beautiful Mass for the feast of Corpus Christi to go to Padre beach (I think it's called) to have a bit of time to walk the beach and take in it's beauty. I'm sorry that I don't have photos of that beautiful day. "Grace Café is an aptly titled book. How does one discover grace — that sublime reality so distant from most people’s vocabulary today and, sadly, so often absent from their lives? Within these pages, seasoned author Donna-Marie Cooper O’Boyle makes that elusive encounter with grace seem as casual and natural as a mid-morning rendezvous with an old friend at the local café. Fyodor Dostoyevsky once said, “Beauty will save the world.” If that is true, then Grace Café — addressed specifically to mothers — could bring many mothers one step closer to salvation. The week end was a whirlwind of grace! I traveled to Corpus Christi, Texas on Friday with my daughter to give a retreat to a wonderful parish - St. Helena of the True Cross Catholic Church. To start off, the flights got messed up on Friday due to the plane sitting on the runway (with us in it) for an hour and a half before take off. We reached Washington DC just as our connecting flight was about to take off. I ran right to a desk and told the gentleman there that we had to get on "THAT plane!" as I pointed out the window behind him. "Last names?" he inquired. And then he clicked away at his computer keys without saying a word. We waited. I thought he was putting in an urgent word to hold the plane for us. Unfortunately, no. I tried my best to get them to allow us on the plane due to their problems with the flight in NY, but to no avail. "I can maybe get one of you there and the other sometime tomorrow," he said without looking up from his computer as he continued to click away looking for other options. I told him that was not acceptable since I wouldn't leave my daughter behind or send her ahead. "I can sent you back to NY" and then he proceeded to tell us the 4 more flights or so to get us to our final destination at some point around midnight. I told him that I didn't want to go back to NY and there must be something else. He said there wasn't anything else and he could at that point only put us both on standby in Atlanta with the hope that we would get a flight to San Antonio and then catch our ride that was waiting there to take us to Corpus Christi. If we couldn't get on a plane that day, we would have to stay some place overnight and get a flight the following day. The problem with that scenario was that Mass was at 8:30 AM to begin the retreat, followed by breakfast and then my first talk. We might not get there until late afternoon according to the airline guy who was assisting us. My daughter and I prayed and got word to our Corpus Christi hosts and hostesses about our dilemma asking them to pray even harder! We found out that we could run and get on a flight that was just about to leave for Atlanta so we had to make the decision immediately to go that route and rushed and got onto that plane. We didn't have much of a choice. After arriving in Atlanta we had at least a couple of hours until we could see about getting on the next flight to San Antonio. We found the people at that airport to be much more challenging to work with. Another hour went by and we prayed. Everyone around us of the 43 "stand bys" compared notes and looked up at the monitor to see where they stood in the line to be picked for that flight which was said to be over-booked anyway. Mary-Catherine's name and mine were the top 2 on the list! Praise God! Still, we waited and prayed many Hail Mary's and Memorares. I was then told that my seat was confirmed. I expressed to the woman at the desk that I could not go without my daughter. She said that we wouldn't know if she could get on until everyone boarded the plane. I told her that we would be praying. She said, "Well, you had BETTER START NOW!" To which I responded, "We have already started!" All of the "stand by" people waited and hoped to get on that plane. The woman then called me over to stand on the side ready to board. Of course, I wouldn't get on until I was sure my daughter could also. I'd give my seat to the next in line. It turned out that the were three seats open. But, just after she announced that, people who had confirmed seats came out of nowhere to get on the plane after the announcement had already been made three times for final boarding time! We continued our Hail Mary's and Memorares. Finally, the woman looked at Mary-Catherine and called her over and checked her through! Praise God! We then boarded the plane and were off to San Antonio! It was our third flight of the day. We would have had to take one more flight from San Antonio to Corpus Christi, but two lovely women, Ada and Nury from the parish came all of the way out to get us and drove us to Corpus Christi. To be continued...sorry about that! Duty calls. I'll write a continuation later today, God-willing. Stay tuned tomorrow for news on the Corpus Christi retreat. It's late now and we have just returned home after traveling all day since 4:30 AM. Thank you very much in advance for your prayers for our travels. I will be traveling with my daughter, Mary-Catherine to Corpus Christi, bright and early Friday morning. I pray that you have a beautiful grace-filled week end for the feast of Corpus Christi. in the sacrament of your body and blood. a solemn pledge of undivided love. This and that: Mostly that! I'll be in Corpus Christi on the feast of Corpus Christi! How do you like that? I am preparing to give a retreat to a great group of 100 or so women. Some have been doing a study of my book: The Domestic Church: Room by Room. I'm happy that I will be meeting them all this week end. Please pray for me for my travels and for guidance from the Holy Spirit. I'll also be re-vamping this new blog soon, so stay tuned for that. I think you'll like it. I will also be featuring guest bloggers and authors who will share their wisdom and inspiration here at View from the Domestic Church. If you are interested in being considered to write a post, please email me (address is in left hand side bar). Bear with me please as I prepare my talks and get ready to fly out to Corpus Christi which translates to possibly no new posts here for 2 or 3 days, depending on whether I have time and an Internet connection. Here is a photo of the study group! I'll be seeing you ladies very soon, God willing! I remember vividly the lazy days of summer as a kid. I enjoyed the relaxed pace and being home or occasional day trips and the beach when I was lucky. :) Being one of eight kids, there was plenty to do at home. I sure had time in my pocket back then. These days, life rolls by at a much more rapid pace. With summer soon upon us, what are your hopes and dreams for this time of year? What would you like to do with your family? Do you have any major goals or projects in mind? Are you planning to try to take it easy and just enjoy a time of relaxation, trips, refreshment? Have you ever thought of taking a pilgrimage type trip with your family? What do you do to keep prayer as part of your summer? I'll chime in later too. To kneel down at this moment to pray. Please listen to the prayer of love in my heart for You. Be in honor and praise of You. As I tend to my family’s needs. The birds are singing and the sun is shining today. It's a glorious day! Since it's a day of rest, I'll keep it simple today and offer an excerpt about Sundays from my book, Grace Cafe: Serving up Recipes for Faithful Mothering. 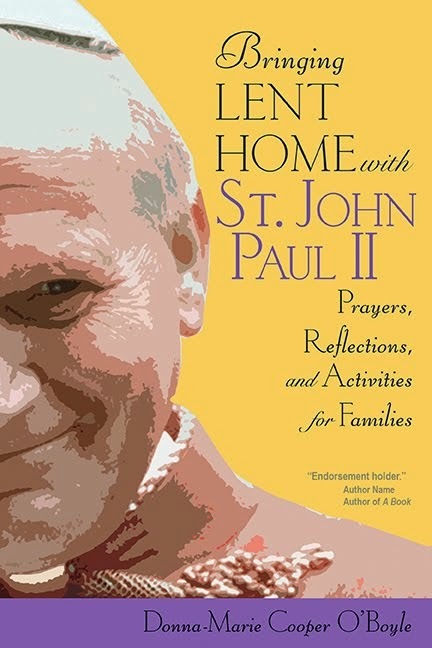 "Growing up in a large Catholic family was celebrated in the ordinariness of our lives. We had our routines, chores, and of course our Sunday dinners. Back when I was a little girl, we didn’t have a Saturday night vigil Mass until a bit later on. We always knew when it was a Sunday because we went to Mass in the morning and usually enjoyed pancakes with bacon and eggs for breakfast and then we usually visited relatives or invited them to our house. All of my siblings and I were always expected to be home for Sunday dinner which we had in the mid afternoon. It didn’t matter what event you were invited to or what else was going on. When it was Sunday, you were home at 2:00 o’clock in the afternoon for a big Sunday family meal together. It was a very rare occasion if you were let off the hook. We enjoyed a simpler meal together later in the day too. It was an extra treat still, when some of our relatives would drop by. We kicked back and enjoyed the day. It was a day of rest, but not exactly so for my mother because she worked hard to put out a very nice spread on the table for all of us. I rarely saw my mother sit down except at meal times or unless the day was finished. We all pitched in by setting and clearing the table and helping with dishes, but looking back I certainly now realize that my mother without a doubt had her two feet firmly planted in the heart of our home in her role of twenty four seven. My mother provided a wonderful tradition for her eight children and my father for family Sundays. It seemed so ordinary and natural for us growing up—that was the beauty in it really. Now being a mother myself I see such richness and profound meaning to Sundays in the family. 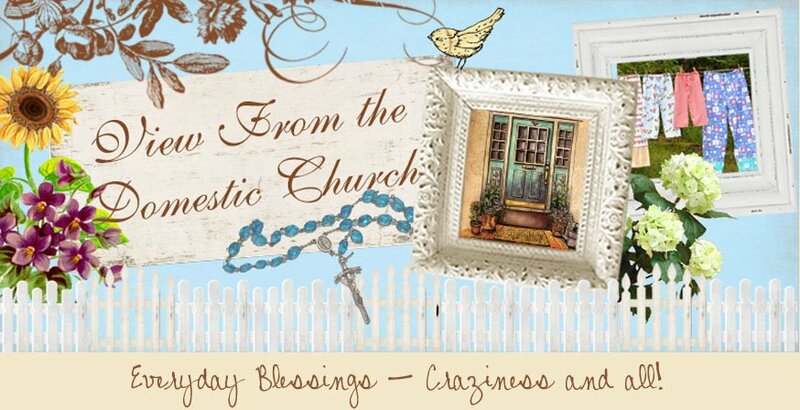 Life in the domestic church is a blessing to be cherished. We know that the third commandment tells us or actually commands us to keep the Lord’s day or Sabbath holy. The Catechism tells us that Sundays are a day designated for the celebration of the Sunday Eucharist, rest and time with family. “God’s action is the model for human action. If God ‘rested and was refreshed’ on the seventh day, man ought to ‘rest’ and should let others, especially the poor, ‘be refreshed.’ The Sabbath brings everyday work to a halt and provides a respite. It is a day to protest against the servitude of work and the worship of money” (CCC, no. 2172). These days though, it's tough to tell one day from another sometimes. We are so busy that I think we carry our busyness into Sundays, too. It's challenging not to do this however when there's so much to do and so little time, it seems! Are we doing too much? Do we need to plan a bit better? What's a Christian mother to do? How do we observe the Sabbath when we are catching up on laundry, washing the kitchen floor (because we haven't had a chance to do it the other day and it is disgusting), and endless other household tasks as well as trips to the store for materials for a school project or our kids just wanting to shop? 1) Vow to make certain adjustments to the Sunday schedule. a) A regular dinner time when everyone is required to be present. b) Less or no shopping. d) And also in any area wherever you need to adjust the activity to achieve more calmness. 2) Hug your kids and spouse. 6) Read to the kids. 7) Take a nap (or daydream about the possibility). 8) Do something outside together. 10) Take a walk in the fresh air, weather permitting. 11) Tell a story while walking. 14) Talk about something inspirational. 16) Plan dinner together (hopefully you have already planned it previously but want the kids to feel included). 17) Get the family to help out with dinner—make it fun. 18) Bake or make a dessert together. 19) Call a relative you have been meaning to talk to but haven't had time. 20) Invite a relative over for a visit. 21) Give the dog a bath (or maybe not). 22) Write a letter--not an email—an actual letter or card that you will put in an envelope and put a stamp on to mail to brighten someone's day. 23) Have the kids write a thank you note to someone special in their lives to express how special they feel to know this person or how they appreciate that person. 24) Dedicate an allotted time to do nothing but ponder and meditate. 25) Plan an outing to possibly a shrine, basilica or pilgrimage site. 26) Get creative; draw some pictures with the kids. 27) Start a new tradition with the kids. 28) Think about what you can do to help a needy family in the upcoming holidays. 30) Smile some more, happy that God has truly blessed you! I'm sure you get the idea and can think of some of your own things to do to and ways to make your Sunday special." Now, go and enjoy your day of rest! Spend it with family and friends and those who could use a visit or phone call. Have a blessed Mass on this feast of the Most Holy Trinity too. Feel free to chime in about your Sunday in the comment box. But, be sure not to spend too much time on the computer! Let's shift our attention from our mounds of laundry to taking our family to Mass. I have spoken to many Moms over the years who express their worries about their kids being too loud or unruly at Mass. The parents get an unplanned work out when they are merely trying to participate at Mass and take in all of the graces. They're busy schlepping back and forth with their little ones for fear that they may disturb someone in the pews. Sometimes they are practically working up a sweat, worried that their children will let out a deafening wail at any given moment. I think we should always be mindful of our children and their occasional outbursts and that if they are acting up, we should take them in the back for a time, when it's necessary. However, we shouldn't ever feel guilty for bringing our children to Mass. Their little voices are beautiful and refreshing. They receive many graces too. We can't expect them to sit perfectly still, but we can try to train them. It all takes time and patience. We should strive to return the glares that we may receive from someone who is not particularly appreciating our presence at Mass with a smile that we muster up and we can whisper a prayer for them too. :) Let's not forget about the many happy moments too, when we'll receive a smile or glowing warm look of approval from others in the pews who catch a glimpse of our families sitting together. Or shall I say, trying to sit together? :) I think it's heart warming when someone in the parish family extends a hand of help to families with many children or after Mass offers a word of encouragement or appreciation to the family who is with us at Mass. We all make up the Body of Christ - all of us. And, I feel that includes the children especially! Jesus said, "Bring the children to Me..."
What are your experiences at Mass with your little ones? What are the challenges? The joys? What have you discovered to work best with the kids? Some like to bring their children close to the front of the church so they can see better while others are petrified to go so close because the scooting out with them when they squawk is a longer hike! Please share with us by way of a comment. We'd love to hear. Maybe a solution you have can help someone else. Maybe a problem you experience can be solved by another parent. Do share, please. We're all in this together and we need to help and encourage one another. Kate Wicker wrote an article recently on the subject which you can read here. Take a look at the comments too. We now have a winner! 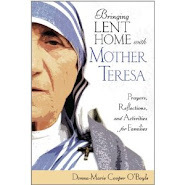 The winner of this book-give-away contest is Melanie B. who wrote, "What gives me the most joy in my domestic church are those moments when my daughters (3 and 15 months) pray spontaneously on their own. it might be a quick Hail Mary for the 3 yr old or folded hands for the baby when they hear a siren nearby. Or the 3 yr old asks if it's noon and then begins singing the Regina Caeli when I answer in the affirmative. When the baby reaches for a crucifix or an icon and wants me to tell her about it or give it a kiss. To know that I am teaching them to love God and talk to Him and to know that He is pouring forth His grace in response to my humble efforts and leading them near to His heart, that gives me the greatest joy. Also seeing them playing together and hearing them laughing together, existing in their own private sister-world. To know that they love each other and take joy in each other. Oh my heart is so full of joy!" Thanks again, everyone for sharing glimpses of your "domestic churches!" I'll have plenty more contests here. I'm hoping too that this blog will become a gathering place for all who wish to share and learn from one another so that we can be encouraged and content in our "domestic churches." Thanks to Jennifer, I now have this beautiful image of the Blessed Mother hanging laundry that I was seeking. It's called the "Polish Madonna." 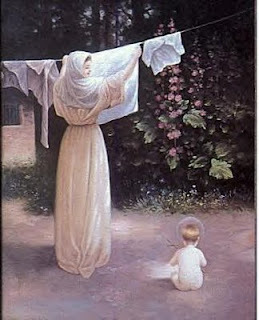 Here's the description that came with the image: "This charming picture depicts Our Lady hanging laundry while the infant Jesus sits nearby. Polish legend has it that the bright warmth of the sun must shine upon the earth on Saturday, if only for a brief moment, in remembrance of Christ's infancy when on that day Mary would wash immaculately clean his swaddling clothes so that Sunday might find delight in witnessing the baby God in pure and fresh-scented dress." Dear Blessed Mother Mary, please look down upon my family. Protect us always from the snares of the devil. Help us to be open to one another in love. Please ask Jesus to grant us the graces we need most and help me to be the mother and wife that I am meant to be. Help me to embrace my vocation and all that it entails with a happy heart! Amen. I'll announce the winner of the book give-away this afternoon. Your comments are amazing and beautiful! There's still time if anyone else wants to submit a comment. 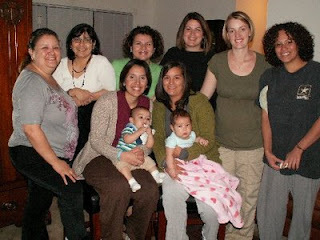 Take a look here and leave a comment about what gives you joy in your "domestic church" within your vocation as a mother if you are interested. And by the way, the comments are quite amazing! It's so heart-warming for me to read all of them - getting a glimpse into your "domestic churches"! To make our home-made laundry soap, we start with these ingredients pictured below. My 23 year-old daughter, Jessica concocted the recipe. We use equal parts of each of the boxed items (really cheap) and then we shave a bar of laundry soap with a cheese grater into the mix to give it an extra boost. The half bar of soap is on top of the box below. It's hard to make out what it is in this photo. You can get bars of laundry soap almost anywhere. She says: "Melt fels naptha in 4 cups of water, fill a clean 5 gl bucket half full with hot tap water, add melted soap, and powders, stir until dissolved. Fill bucket to top with more hot water, let sit overnight. It will gel up and become quite thick. Add (optional essential oil) fill clean laundry soap container half with water, and half with gel. Shake well before each use. Viola, for $2.00 you can wash 640 loads in a front loader." This creative woman also makes clothes pin bags! 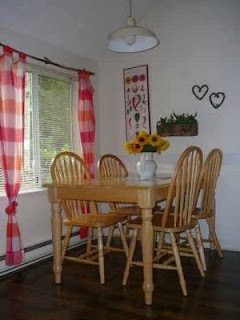 Here's one of her designs that she sells from her blog. No, this is not a child's shirt hanging on the clothes line. It's a clothes pin bag. Clever! You can also take a peek at Line Dry.Com for various laundry needs. May God bless you in your domestic church as you strive to serve Him in your families! Isn't she so cute? This is Sara, Jennifer's daughter. Sara loves doing laundry with her Mom! Jennifer is the first to send in photos of laundry day and will be entered into a contest to win a book! I didn't get a chance to post my laundry soap recipe as I said I would. Sorry about that. It was a busy day and night. My daughter who is graduating from high school received two scholarships at a ceremony tonight. I am very proud of her. Since it's getting very late now, I'll visit with you tomorrow with that recipe. While this blog is not all about laundry, (it may seem so at this point!) I thought that while we're on the subject, I'd offer a couple of prayer verses today about that never-ending but grace-filled chore. I'll be bringing you a home-made laundry soap recipe that I use, a bit later on today and maybe some other goodies as well. Stay tuned! 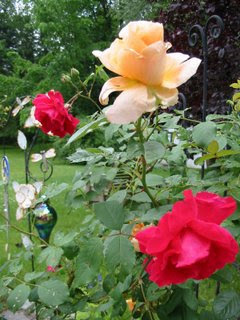 Enjoy the day and maybe you'll even get in some Hail Mary's as you tackle some chores. Go have some fun too! 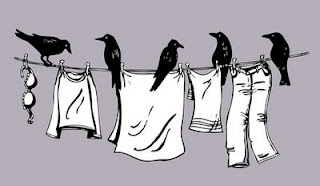 Who likes hanging their clothes out on a clothesline? I personally love the look. Maybe I'm old fashioned or a country bumpkin as I have been called - but I absolutely love clothes hanging on a line. I love knowing that they are being dried out in nature. 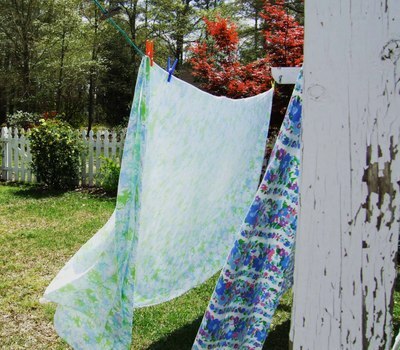 Years ago, I was labeled a "country bumpkin" behind my back in one neighborhood where I lived because I hung my wash out to dry in the natural breeze under the hot drying sun. I like being natural, what can I say? Not everyone appreciates nature. We live in an age of technology, after all. I will admit though, that most of my clothes are dried in a gas dryer these days. Various physical injuries and a car accident a little over a year ago prevent me from lugging wet clothes out to a clothes line. I miss it, but I adjust. So, what am I getting at besides talking about the beauty of clothes drying out on a line? Well, I'm asking you to send me a photo of your clothes hanging out to dry on your clothesline! I'd like to feature them in my blog title for this blog. So, what do you think? Do you have a camera nearby? Are your clothes on the line? If so, send me a photo to DMCOBoyle@aol.com and I may use it with your permission, of course! And, guess what? 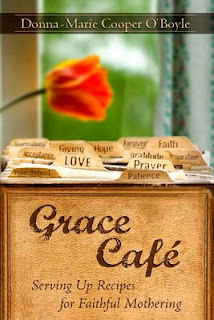 All those submitting photos will be entered into a drawing to win a copy of my book, Grace Cafe! To the line of clothes, already stiffening in the freezing temperature. Attempting to blow through her clothes and whip at her back. Unnoticed by the speeding motorists passing by. As only a mother’s love can. 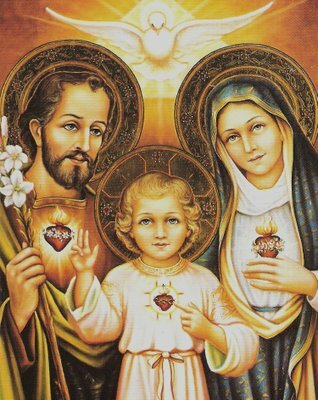 Jesus, Mary, and Joseph, have mercy on us and pray for us. Just after I posted this, I heard from Helen on Face Book telling me that she had posted something similar recently. I just love her post and her clothesline. Go take a look. So many amazing things happen around the kitchen table, don't they? It's a place to gather as a family for nourishment of our bodies. However, it is truly a place to nourish our hearts and souls too. Yes, sometimes the atmosphere may be rather chaotic and we're spending more time as a parent trying to settle the little ones and be sure they are sitting on their chairs and not running around the house than we are carrying on any sort of understandable conversation or managing to eat much ourselves! No one said it would be Norman Rockwell picture perfect! But, we survive, don't we? And we look back and we can laugh. This is not to say that every meal is marked with turbulence and discord, but we know that they very well can be. Perhaps, we can drop the level of our expectations a bit and lighten up too so we can teach our children well and then eat without getting indigestion! But, what about those soul enriching times too? They also happen as we gather as a family, united in love and as Christians. It's a wonderful time to regroup after some family members being away during the day at work or school. For home-schooling families, it's a time when Dad comes home to reconnect and all can sit down for that blessed event of breaking bread together. Let's be extra cognizant of what truly happens at our kitchen tables. God is present - amazing! He joins us in our domestic churches. Let's utilize our gathering as a time for prayer - Grace before and after meals and an Our Father or Hail Mary prayed together. We can voice a few prayer intentions for those in need as well. We then have created an occasion of family prayer along with our meal. What else happens as we gather? We get to share about our days, recounting events, looking to tomorrow, too. Families are a blessed group of people that God has joined together to help each other work out our salvation! Isn't that great? So, next time you sit down to a meal with your family, whether it be at the table or on a blanket out in a park, or at a restaurant or diner someplace, let's be mindful of the amazing connection going on between all of us and the available graces for the asking. Let's think about our responses to all gathered. Do we act in love? Always? 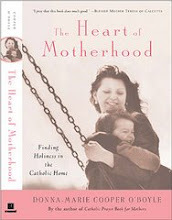 I speak about these family gatherings in my books, particularly: The Heart of Motherhood: Finding Holiness in the Catholic Home, Grace Cafe: Serving up Recipes for Faithful Mothering, The Domestic Church: Room by Room: A Mother's Study Guide, and Catholic Prayer Book for Mothers. 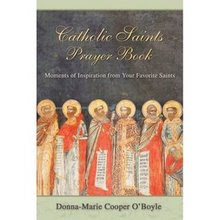 They are all available through my website: http://www.donnacooperoboyle.com . I'd like to feature this topic, "Around the Kitchen Table" here at "View from the Domestic Church." I'd like to ask you all to share your stories here. What happens around your kitchen table? What sweet thing did your child voice out loud recently? What special connection did you see happening in your family today? What had you in stitches? What challenge did you experience but now have a way to overcome it? What became a teachable moment? Oh, I'm just full of questions, aren't I? Well, here are a couple of more! Can you share your experiences with us? Will you? Please do! God bless all of our domestic churches, please God! I think it's necessary to have a book contest to celebrate the launch of this new blog, don't you? Therefore, I will be giving away at least one copy of my book The Domestic Church: Room by Room: A Mother's Study Guide to the winner. All that is required is for you to leave me a comment to this post about your "domestic church." Tell me what gives you the most joy in your vocation as a mother. 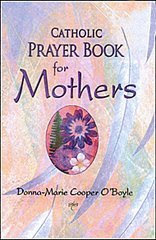 This blog is not only for mothers, but I am asking the mothers this time since this book addresses mostly mothers. However, if you are not a mother, but wish to comment on a mother you know, feel free! If you already own this book, you can still enter the contest and if you win, just give it away! I will pick the winner this Friday, June 5th. So, you'd better hurry and please pass the word about the contest. Thanks and God bless your day! Go on over to "Moments of Inspiration with your Favorite Saints for a bit about St. Justin whose feast day is today.